LG Displaystarted construction of an OLED assembly plant in Hai Phong, Vietnam in May 2016, which was to be an alternative to the Chinese assembly operations that are used for many CE devices. The plant, which was to be continually expanded over a four-year period, would consist of 13 buildings and is expected to employ 10,000 to 12,000 workers when fully built out. The production capacity, which LGD says was a result of rising labor costs in China, is expected to assemble 7m to 8m small panel modules (smartphones, tablets, etc. ), and potentially between 90,000 and 100,000 OLED TVs, however LG Electronics has been shipping ~4.5m smartphone units/month on average (last 10 quarters) and the GooglePixel smartphone line, whose display module is also produced by LGD, has sold only a few million units overall, which seems to indicate that the assembly plant has been underutilized and indications are that the plant sustained a net loss of $13m last year. LGD has now made a second contribution to the plant’s capital, adding $188.6m in funding over the last few months. The first round of additional funding, after the initial start-up, was not an easy one, with the Ministry of Vietnam rejecting LGD’s proposal as it consisted of only a small portion of capital from LGD and large loans, likely secured by the plant assets, leaving LGD with only a 6.3% stake in the project. The Vietnam government instituted a program to examine foreign investments in the country in 2017, fearing overly leveraged projects could fail and tarnish the country’s image as an alternative to China. Eventually LGD agreed to invest $500m and secure $600m in loans in order to gain approval. 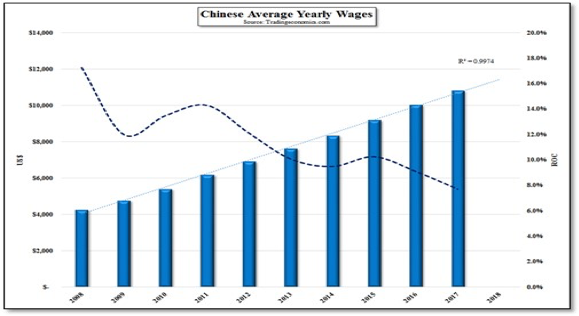 With the increase in Chinese annual wages averaging 11.6% over the last 10 years, high volume display producers have been looking for alternatives for module assembly and other labor intensive jobs associated with both small and large panel production. Vietnam and the Philippines seem to be the most popular choices, and while the US trade war with China might be influencing plans, these investments are designed to lower costs, with near-term tariffs less of an issue in these decisions. China has been quite generous to panel producers as to subsidies, which range from supplements to quarterly operating expenses to infrastructure, including assets, such as the $1b worth of coal mining rights given to BOEwhen it decided to build an OLED display plant in Ordos, Inner Mongolia, a region not known for the production of electronic devices and one that is essentially on the opposite side of China from BOE’s other facilities. Those incentives are a strong draw to capital intensive businesses such as panel production, but worker wage growth and a shift in Chinese technology focus (to semiconductors) could limit those incentives, making Vietnam and other lower-cost labor markets more attractive to panel producers.